I’m back! Finally! Apologies for deserting Eating Covent Garden for so long – I have been travelling the world, like really travelling the world! Since my last post in December I have spent time on four continents (two for the first time) and I have so much to share with you all. So watch this space. I’m starting with my latest restaurant discovery in the stunning Constantia winelands in Cape Town. Yes, I’m back in Cape Town, hooray, and straight into one of the country’s top restaurants. 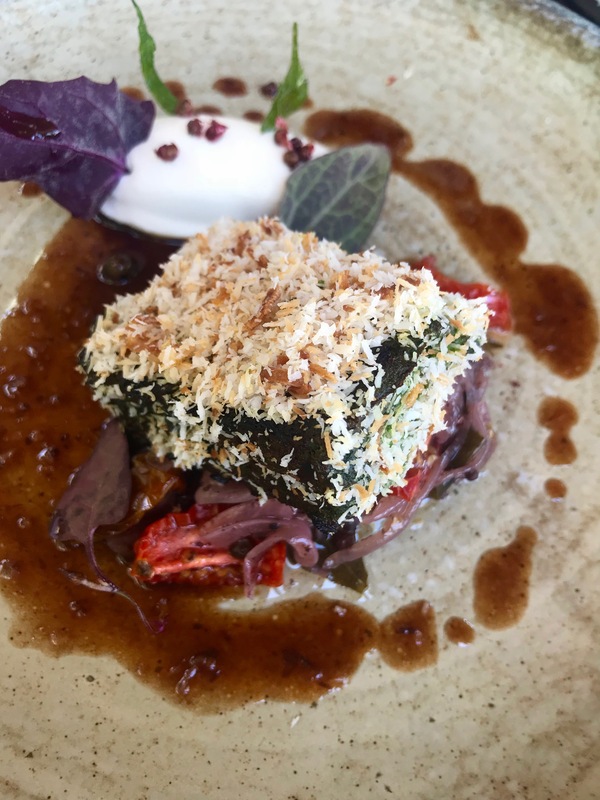 Chef’s Warehouse at Beau Constantia opened a couple of years back and was voted the fourth best restaurant in South Africa in the Eat Out Mercedes Benz Restaurant Awards 2017. There are myriad great restaurants in this foodie country so that’s quite an accolade for such a youngster. 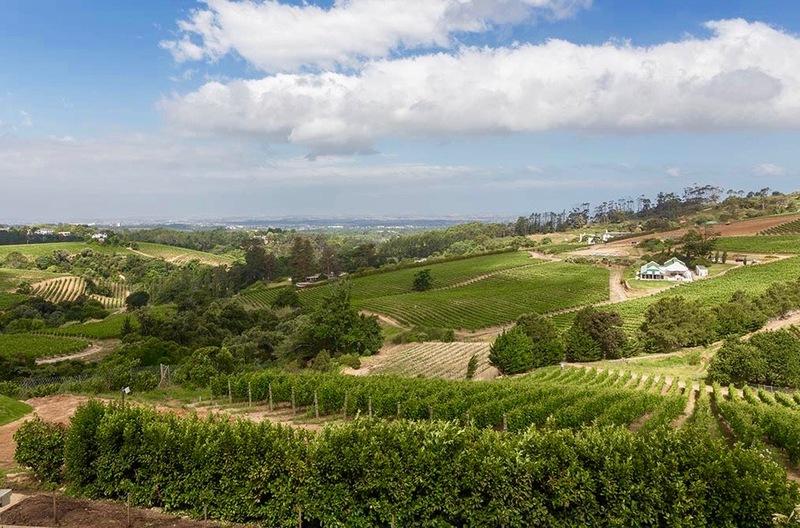 It sits at the top of the Constantia Valley with views over vines and forests towards the ocean. This makes the parking lot seem a little perilous, particularly for the vertiginous – make sure you’re steady on those heels if you’re thinking of wearing them. The restaurant is a modern, glass-sided construction which certainly makes the most of the views. As soon as we were seated with a glass of their lovely Pas De Nom MCC bubbles (the perfect way to start any lunch), my dreaded menu indecision loomed large! Until I spotted the magic words Tapas for 2. No choices to be made here, it’s eight dishes to share. Makes life easy. Dishes arrive in groups of two or three in three batches – I guess you could call it three courses. We started with a triple-plate sensation. 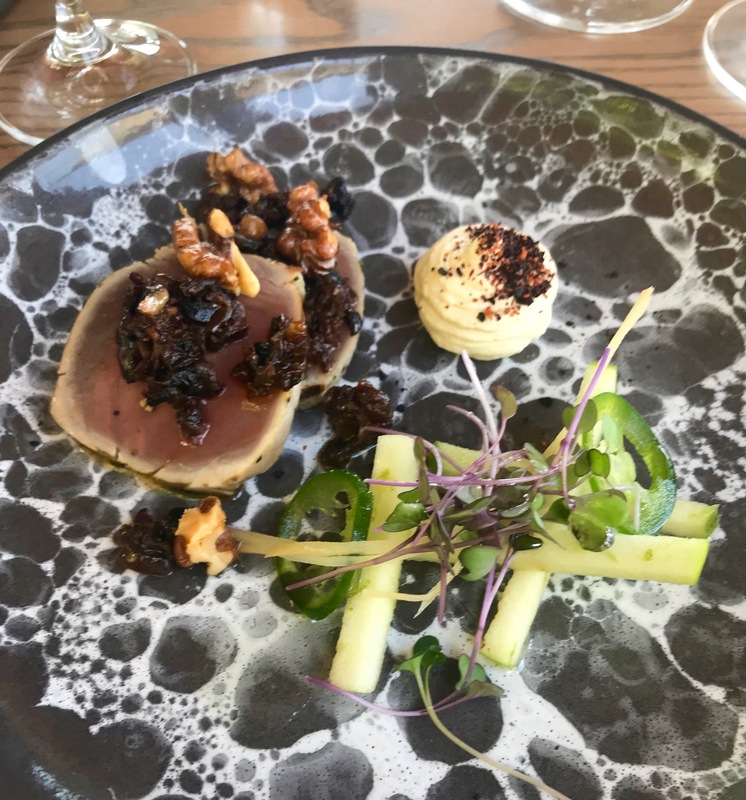 The coal-seared tuna came with warm black bean and walnut salsa and a fresh apple and ginger relish, on a plate with a visually confusing foam design. There is no foam with this dish – it’s the plate! My favourite of the first trio was the line fish sashimi. 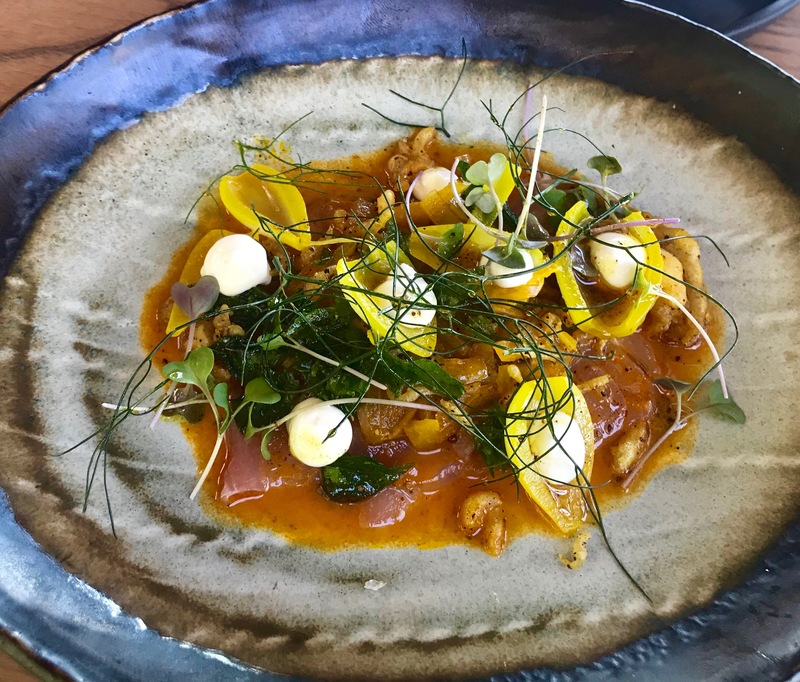 A beautiful curry-based concoction with the freshest of yellowtail, Cape Malay pickle, bbq garlic emulsion and fried batter. Seems like the perfect mix of flavours and textures. The Vietnamese BBQ beef came with herbs, toasted rice and a zesty Vietnamese dressing. Love those fresh, clean flavours and the herby crunch. After a short break the next duo was delivered. 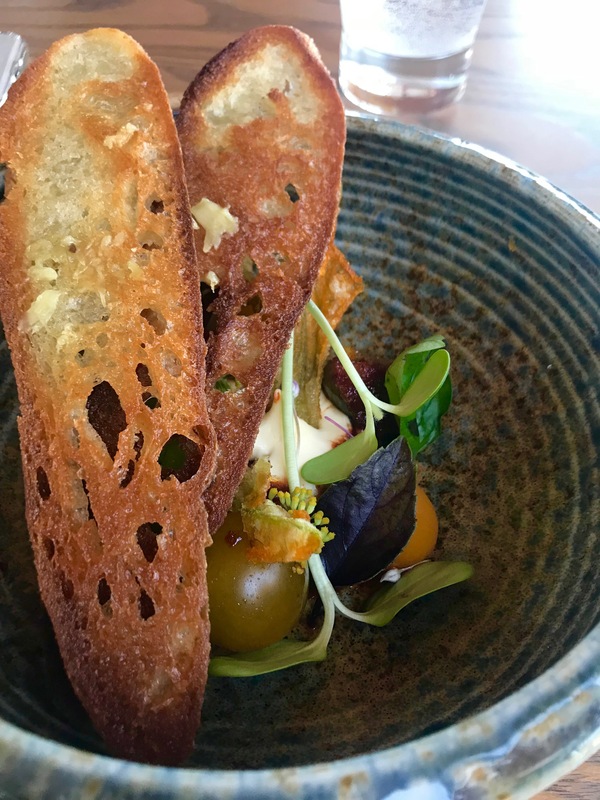 Described as Beau tomato bruschetta, smoked, pickled and grilled, a bowl of tomatoes done three different ways was topped with garlicky, thin slices of toasted bruschetta. I love a tomato – pretty much any tomato – and these were in a league of their own. And then the ultimately indulgent dish. 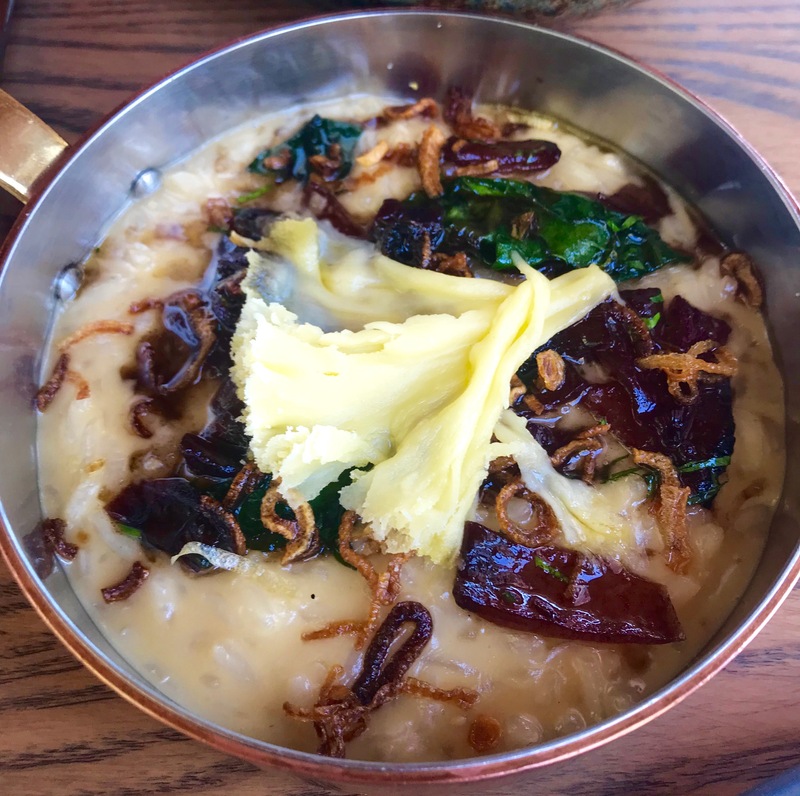 Parmesan and smoked butter risotto with red onion bordelais and fried Swiss chard, all topped with a delicately creamy, cleverly crafted gouda flower. I love the creaminess and softness of a good risotto but always balk at eating a full portion – it’s just a bit rich and filling for me. What joy to share a small portion of this deliciousness between two. And never has gouda tasted so good. Needless to say we both wished for a bigger portion once we’d cleaned the pan. Probably the nicest risotto I’ve ever tasted. So how could it get any better? Well, there were still another trio of masterpieces to come. 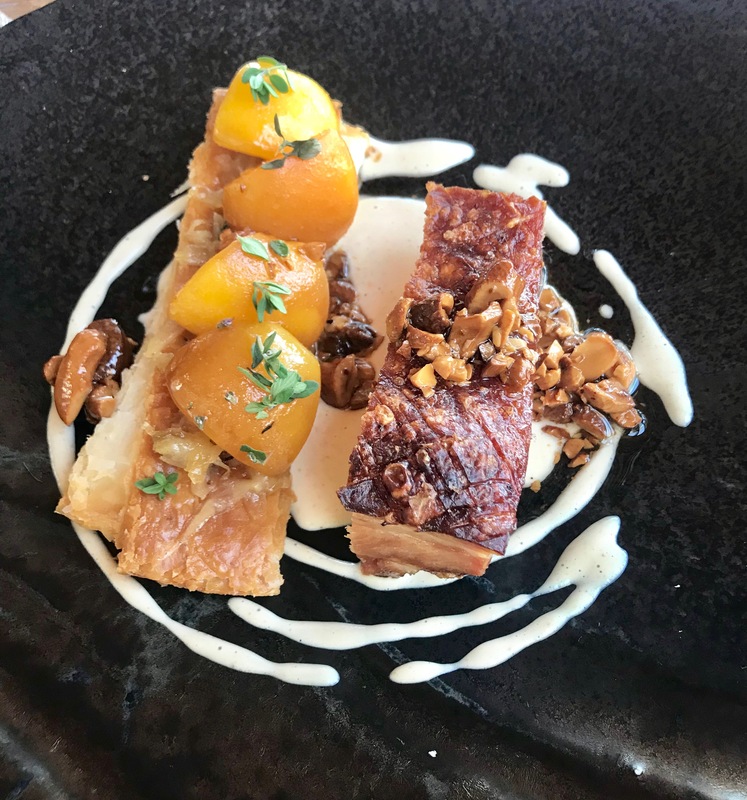 The slow roasted pork belly was served with an apricot and miso tart, cashew nut milk and garlic and thyme oil. The tastiest of pork that fell apart at the touch of a fork and was topped with the crispiest of crackling matched wonderfully with the creamy cashew nut milk (there’s a first for me). And the light and crumbly miso tart, topped with firm, tart cooked apricots was the ideal accompaniment. 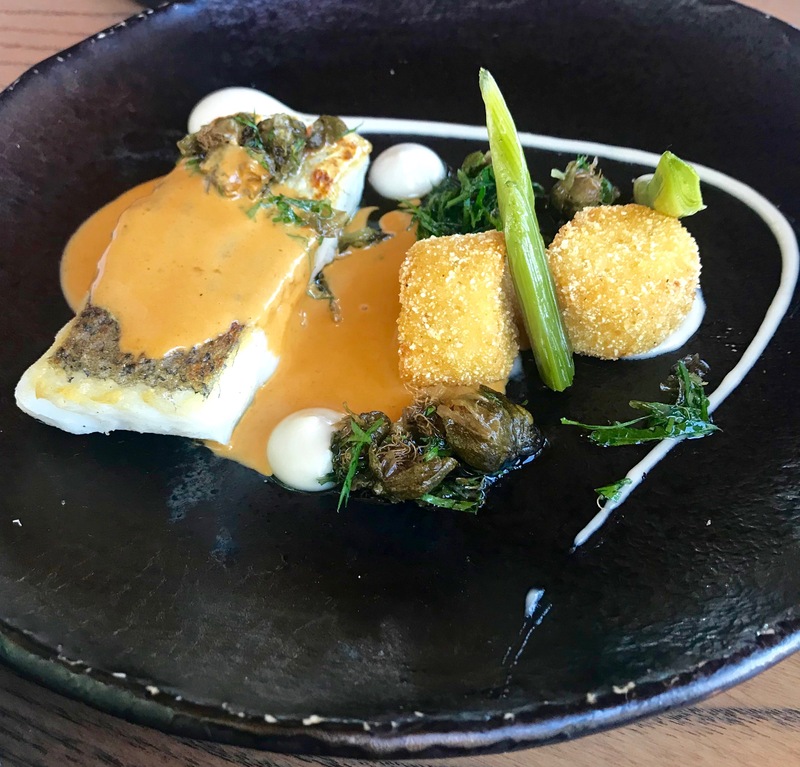 Firm, flaky hake came with a delicate yet intense parmesan and anchovy puree and was topped with paprika and lemon cream. The dainty fried polenta cubes, salty capers and crunchy spring onion completed another masterful dish. 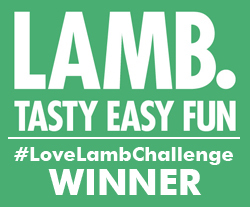 And finally it was time for some lovely lamb. The adobo rubbed, slow-cooked rib came with red onion, heirloom tomato pickle, burnt butter and mixed pepper jus. Tender richness to savour. I’ve fallen in love with Beau Constantia. How can you not with a view like this? 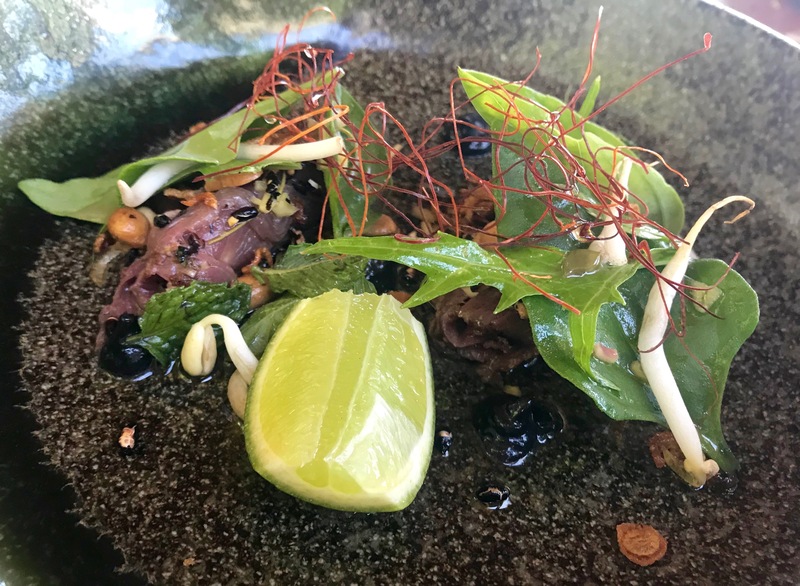 And all that great food – light, fresh and cleverly balanced – and all looking so beautiful – like the greens and blues of the outlook across the valley. Tapas for 2 comes in at R700 (about £41 at today’s exchange rate). That’s for both of you, not each. A bottle of their delicious Rose was R180 (just over £10 at today’s exchange rate).